No RSVP needed to experience this lavish display of art! Mesquite Fine Arts Gallery hosts its annual Fine Art Invitational Exhibition, August 31-September 26. 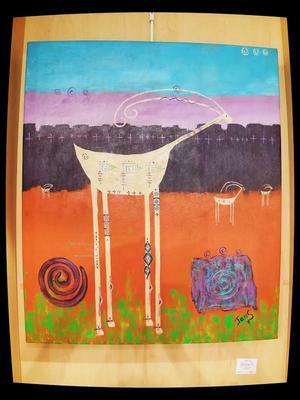 This is the fourth year that gallery operator, Virgin Valley Artists Association (VVAA), has gathered artist groups from across the region to jointly display the best of their original artwork. This year five Nevada organizations participate: Boulder City Art Guild, City Lights Art Co-op Gallery of Henderson, Moapa Valley Art Guild, Spring Mountain Art Guild of Pahrump, and Mesquite host, VVAA. Utah artists from Dixie Watercolor Society, Southern Utah Art Guild and Southern Utah Watercolor Society round out the field of exhibitors. Visitors are invited to view and enjoy this abundant collection of original fine art Monday through Saturday, 10a to 4pm, through September 26. On the closing Saturday, many artists will be on hand for a “meet and greet” public reception, 2-4pm. 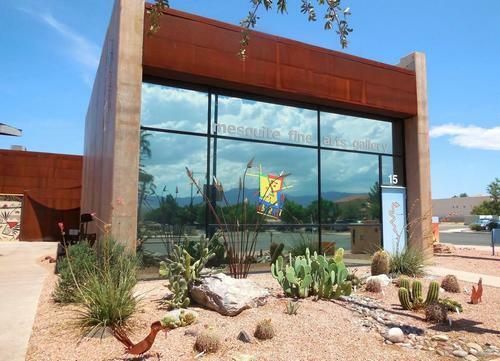 The Mesquite Fine Arts Gallery, located at 15 West Mesquite Blvd, Mesquite NV, has been the town’s cultural hub since it was built by the City of Mesquite in 2003. The gallery is an easily-recognized landmark, with its colorful murals, painted utility boxes, and a lovely desert garden that was installed by the artists. VVAA is responsible for managing the gallery’s rotating exhibitions of fine art and giftware, along with seasonal art sales, including its annual Christmas Boutique (Nov 23-Jan 2) and spring art sale. The gallery is staffed entirely with VVAA member volunteers, who also offer a robust curriculum of art classes and operate a full-service pottery studio. Art workshops and classes and use of the pottery studio are available for “drop-ins” who are visiting town on short term. VVAA proudly displays beautiful member work with “Made in Mesquite” labels. Its members’ artwork is found in private collections worldwide. Gallery admission is free, and all artwork and giftware is available for purchase. This pleasing venue hosts cultural and social events such as literary and poetry readings, concerts and artists receptions. Phone 702-346-1338 or see mesquitefineartscenter.com and on Facebook for more information. Gallery visitors looking for a good meal should follow the locals to Panda Garden Chinese Restaurant. Located directly across the street from the Mesquite Fine Arts Gallery in the center of town, Panda Garden offers consistently good meals at very palatable prices. Service is always kind and efficient, and their fortune cookies never disappoint! Open daily for lunch and dinner, 11am to 10pm. 10 Mesquite Blvd, phone 702-346-3028.